FAIRFIELD, Connecticut, November 11, 2010 (ENS) – GE today announced the world’s largest-ever single electric vehicle commitment. The company will purchase 25,000 electric vehicles by 2015 for its own fleet and through its Capital Fleet Services business. GE Chairman and CEO Jeff Immelt said the company will convert at least half of its 30,000 global fleet to electrics and will partner with fleet customers to deploy a total of 25,000 electric vehicles by 2015. GE and its partners will use a mix of electric vehicle technologies. GE will initially purchase 12,000 General Motors vehicles, beginning with the Chevrolet Volt in 2011, and will add other vehicles as manufacturers expand their electric vehicle portfolios. 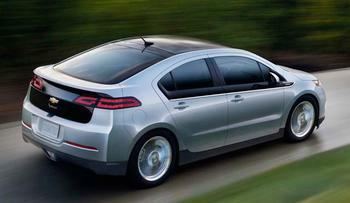 Chevrolet Volts will roll off production lines this month and other automakers are bringing electric vehicles to market. Immelt said this purchase will enable GE to lead wide-scale electric vehicle adoption and generate growth for its businesses. “We make technology that touches every point of the electric vehicle infrastructure and are leading the transformation to a smarter electrical grid,” Immelt said. GE manufactures an electric vehicle charger, the GE WattStation, which is designed to cut the time needed for vehicle charging from 12-18 hours to as little as 4-8 hours compared to standard charging, assuming a 24 kWh battery and a full-cycle charge. The WattStation uses smart grid technology to allow utility companies to manage the impact EVs have on the local and regional grids. GE businesses including Capital Fleet Services, Energy and Licensing and Trading will benefit from an emerging electric vehicle market that could deliver up to $500 million in GE revenue over the next three years. This includes rapidly developing markets for the WattStation. GE also announced today two electric vehicle customer experience and learning centers to provide customers, employees and researchers first-hand access to electric vehicles and developing technologies. One center will be located outside of Detroit, in Van Buren Township, Michigan, as part of GE’s Advanced Manufacturing and Software Technology Center. The other center will be located at GE Capital’s Fleet Services business headquarters in Eden Prairie, Minnesota, with several other centers to be announced in 2011. The centers will monitor and evaluate vehicle performance and charging behaviors, driver experiences, service requirements, and operational efficiencies, while also affording the opportunity to experience a variety of manufacturers and models, and gain insights on electric vehicle deployment. In support of GE’s purchase, an electric vehicle readiness toolkit has been launched on www.ecomagination.com to help municipalities, customers, and individuals prepare for wide-scale electric vehicle deployment. In April, GE and Nissan signed a three-year agreement to explore new technologies that are needed to build a reliable, dynamic smart-charging infrastructure. The Japanese automaker will roll out its all-electric Leaf vehicle next month in Japan, the United States and Europe.